More than 65 Heritage Trees have been designated in communities all across Ontario. Celebrate those already recognized or check out the new Trees announced during National Forest Week! What: Forests Ontario’s Heritage Tree Program collects and shares the stories of Ontario’s diverse and unique trees and brings awareness to the social, cultural, historical, and ecological value of trees. Trees are nominated for recognition based on their historical or cultural significance, and also recognized for their distinctness in size, form, age, or rarity. More about the Heritage Tree Program can be read here. •	Minnie Sheridan - a lively centenarian from Clarksburg - planted this impressive Walnut Tree alongside her mother, 70-years ago. It stands at 50-feet-tall and provides a hardy variety of ‘grocery store-style’ walnuts, which Minnie continues to harvest each year. •	The Champlain Oaks are a community of healthy, pre-settlement Bur Oaks descended from the open forest of the Ottawa River shoreline. They were named after Samuel de Champlain who explored the area in the 1600s and would have seen some of the parents of these current oaks. It is very rare for urban trees of this age to be surrounded by a residential development. These trees likely survived due to a common practice of leaving clumps of trees on farmland as boundary markers and windbreaks. These oaks are prominent landmarks in the community and are defining features that connect the neighbourhood. •	This magnificent pair of ancient white oak trees stood on the Lake Ontario shoreline before the first European settlers arrived in 1793 to establish Port Hope. It is thought this sandy oak savanna site was used by Iroquoian peoples for hunting and gathering grounds when they used the trail (now Lakeshore Road) to harvest salmon and sturgeon from the Ganaraska River. Photos of these trees grace the cover of Port Hope’s Municipal Forest Master Plan and all Trees of Distinction promotional materials. 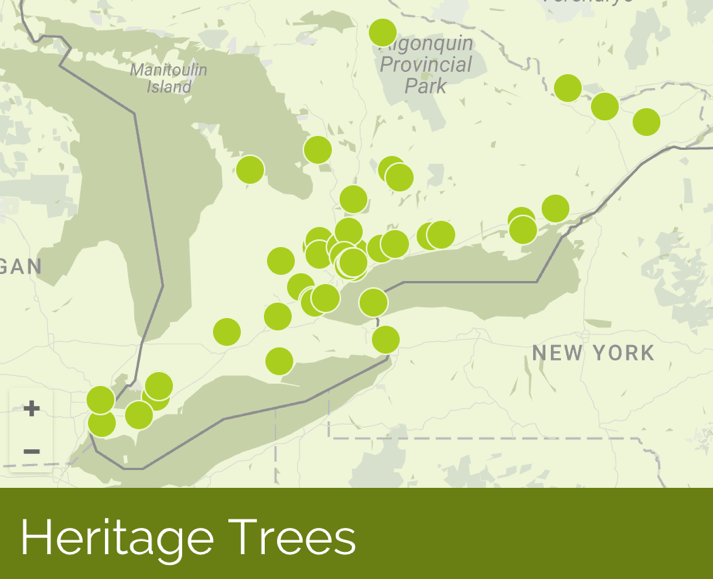 To see a full map of Heritage trees across Ontario go to https://www.forestsontario.ca/community/in-the-spotlight/heritage-trees/ . Forests Ontario’s Heritage Tree Program collects and tells the stories of Ontario’s diverse and unique trees and brings awareness to the social, cultural, historical, and ecological value of trees. Trees are nominated for recognition based on distinctness in size, form, age, rarity, or their connection with historically significant events, individuals, or locations.